A guide to stopping inappropriate urination and getting rid of cat urine odor. Is your cat squatting over the sofa, stinking up your pillows, or ruining the recliner? You might feel like you’re life has become an ammonia-scented nightmare. You need to find out how to stop your cat from peeing on the furniture to wake up. Your first step is to find out why your cat is going outside of the litter box. There’s a common myth that cats pee outside of the litter box to spite their human guardians. The truth is that most cats are tidy creatures and won’t urinate outside of the litter box without reason. Myths like this one are part of the reason why so many cats are surrendered to shelters when they go outside of the box. Poorly-researched people assume that they won’t be able to reverse the behavior and give their cat to a shelter instead. That cat could suffer from the black mark of a behavioral problem for the rest of his life thanks to a poor understanding of what makes cats go outside of the litter box. Instead of giving up so quickly, we need to play an elimination game. 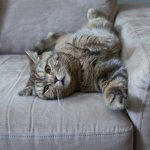 Let’s start with the basics to find out why your cat is using the furniture instead of his litter box. Rule out any medical issues. Many people jump to the conclusion that their cat’s inappropriate urination is a behavioral issue. Much of the time, that’s not true. Urinating outside of the litter box often points to a medical issue instead. Inappropriate urination can be a sign of feline lower urinary tract disease (FLUTD), kidney disease, hyperthyroidism, arthritis, and diabetes. Some of these diseases cause frequent urination as well as pain while urinating. Some cats will associate that pain with the litter box, eventually avoiding the box in an effort to escape the pain. These are all serious issues, so don’t hesitate to get your cat checked out if they’re suddenly avoiding the litter box! 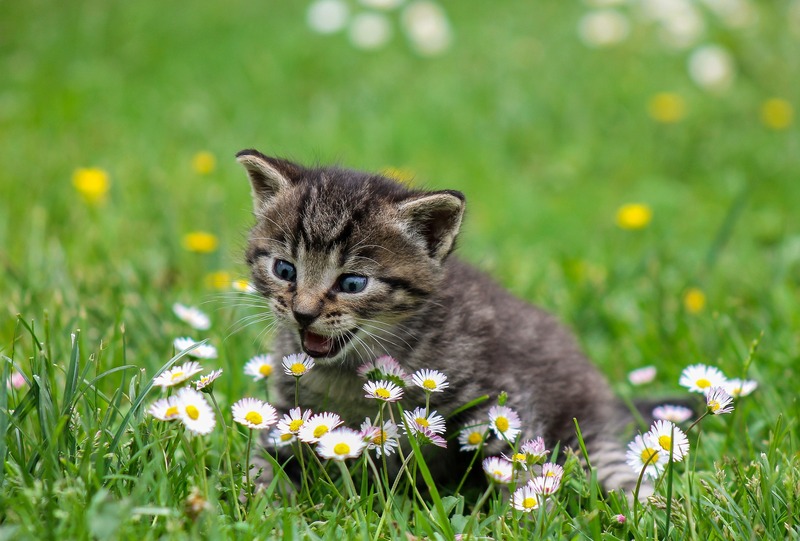 Finding out whether or not your cat is sick and getting them treated if they are should always be your first step if your cat is peeing outside of the litter box. 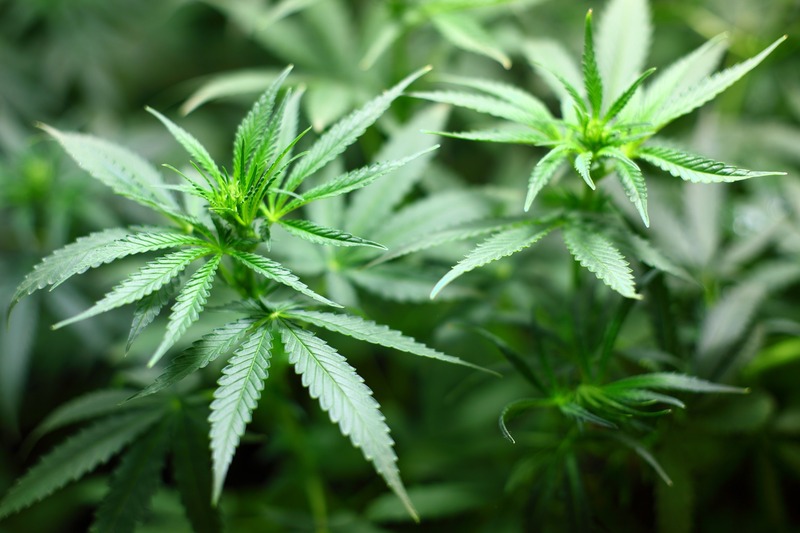 Stress can also play a role in inappropriate urination. Stress is probably the biggest motivator for cats to go outside of the litter box. Cats don’t always handle stress well and, unfortunately, often get stressed out easily. New furniture, a change in your schedule at work, a move, a new puppy—all of these things could exacerbate stress. While some cats express their stress by hiding or becoming more vocal, some cats let it out by peeing on the couch. In addition to being an ineffective training method in the first place, this is why you should never yell at your cat for making a mess. Your cat is probably already stressed out, and your fury is only going to make it more likely to happen again. Try these methods to minimize your cat’s stress. Cats like routine. Try to set up a regular routine with your cat—feeding, playing, etc.—so that your cat feels like life is stable and secure. Give your cat vertical space. Many cats feel more confident when they’re able to watch over everything from above. Try installing cat shelves on your walls, or if that’s not an option, purchase a tall cat tree. If a new puppy or baby is bothering your cat, they’ll be grateful for this method of escape, too. Invest in a Feliway diffuser. You’ve probably noticed your cat rubbing his cheeks on you. Feliway is a synthetic version of the feline facial pheromone and is a popular aid to help calm down anxious cats. 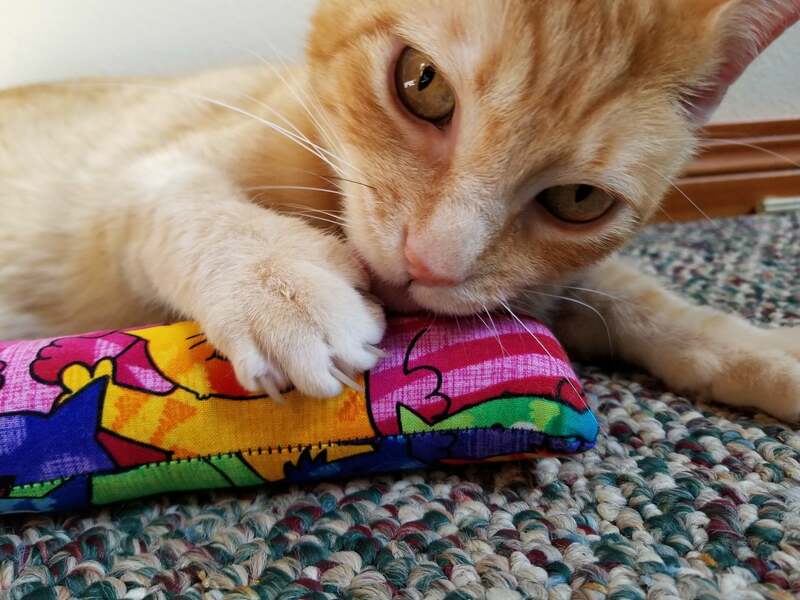 Offer a calming chew made for cats. These VetriScience Composure chews receive primarily positive reviews and seem to work great for many cats. Next, make sure you’re keeping your cat’s litter box up to his standards. Some cats are super-selective about their toilets. Would you want to use a toilet that was already filled with your own waste… not only use it but stand in it? Not many would, and our tidy cats also have standards. The sofa might be a more hygienic place to go than the litter box. Scoop your cat’s litter box twice a day and scrub it out completely once a week. If your cat won’t settle for less than a cleaning after every use, consider investing in an automatic-cleaning litter box like the Litter Robot. Automatic litter boxes are expensive, but if they fit in your budget, an automatic box will make keeping up with your cat’s cleanliness standards a lot easier. Keep in mind, however, that some cats find Litter Robots too small or the cleaning cycle frightening. In addition to keeping your cat’s litter box clean, use a litter your cat likes, too. Unscented, fine-grained clay litter is a popular choice for most cats. If that doesn’t work for your cat, experiment until you find one he likes. For a complete list of the best cat litters, click here. Consider the placement and design of your cat’s litter box, too. Cats aren’t just choosy about how clean their litter box is, they also have litter box design and placement preferences. Our cats’ favorite litter boxes are large, open-topped litter boxes. If your cat has arthritis or joint problems, choose a litter box with a lowered side opening so he doesn’t have to jump over the edge. We don’t like enclosed litter boxes for a few different reasons. Yes, they contain odor and are more discreet in your home, but that doesn’t make them ideal for your cat. Enclosed litter boxes with only one entrance can make cats feel trapped while they’re using the toilet. They’re also not well-ventilated. The covered litter box keeps the odor away from your nose but builds up inside the litter box and makes using the toilet a stinky experience for your cat. Experiment with different litter box styles to find out if it’s the box deterring your cat. Location is important, too. If your cat’s litter box is in a high traffic location where the dog can get at him but your bed pillows are secluded, he might just head for the pillows. Here are a few guidelines for litter box placement. Place your cat’s litter box in a quiet location where there won’t be a lot of foot traffic. Your cat is most vulnerable when they’re using the toilet, so they’ll often feel uncomfortable using the litter box if they’re exposed to a lot of people or pets passing by. Avoid placing your cat’s litter box in a corner. Remember, cat’s don’t like feeling trapped and a corner makes them vulnerable. If you have a multi-story home, try to place a box on each floor. A general rule of thumb is one litter box per cat + one extra. If you have one cat, you’ll have two litter boxes. Four cats = five litter boxes. This gives each cat enough of his own litter box territory. 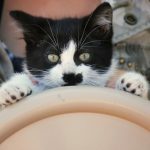 If you’d like to learn more about litter box placement, check out this excellent guide from Litter-Boxes.com. Is your cat actually spraying? Your cat’s inappropriate urination may be hormone-related. Is your cat still capable of becoming a parent? Cats who haven’t been spayed or neutered are much more likely to mark their territory by spraying than cats who were spayed or neutered as kittens. There’s a difference between spraying and urination. Does your cat back up to the furniture with tail high and quivering, and eject a stream of urine? That’s spraying—cats squat when they pee. This territorial marking behavior can be exacerbated by stress or a heat cycle in female cats. If your cat is spraying, they probably won’t stop unless you get your cat spayed or neutered. Even then, cats who were intact into their adulthood are more likely to continue this marking behavior even after the operation. The best way to prevent spraying is by keeping your cat’s stress low. While your cat may still spray if the neighbor cat is hanging out by the window, using the stress-reducers we mentioned above will help. Now it’s time to get the cat pee smell out of your furniture and carpet. You’ve identified the causes for your cat’s inappropriate urination and are making a plan to take care of them. Now you need to deep clean all of the surfaces that your cat has urinated. A sub-par cleaning job will leave traces of odor—enough for your cat to detect and come right back to that spot, thinking it’s his new litter box. Use a blacklight so you don’t miss anything. Sniffing around for cat pee stains might be semi-effective, but if you want to clean up your cat’s urine mess properly, invest in a blacklight. A blacklight will help you to find out exactly which areas your cat soiled and make sure you’re dousing everything—even stray sprinkles. Remember, even the best cleaning job will be useless if you don’t get the entire mess. Cats have excellent senses of smell and just a little urine left behind will be enough to bring them back. Let’s take a look at the different kinds of cat urine odor removers available. Surfactant cleaners are great at removing stains but can leave lingering odors. Many cat urine removers are simple surfactants—they’re simply a detergent intended to get rid of the initial urine stain and remove odor. Unfortunately, surfactants won’t eliminate cat urine odor in the long term. Cat urine odor is persistent thanks to its high concentration of uric acid. Uric acid forms near-insoluble and pungent crystals which linger for a long time after the rest of the stain has been washed away. A surfactant will wash away most of the urine, but these insoluble uric acid crystals will stay behind. The odor might temporarily dissipate, but your cat’s sensitive nose will still be able to detect the presence of the urine. You will too if the floor ever gets wet again or the air humid enough. However, a surfactant can clean up the stain after you’ve already treated the area with an enzyme cleaner. Skout’s Honor Urine Destroyer is a surfactant-based product with a commitment to being environmentally-friendly and a history of effectivity. An enzyme cleaner will eat up uric acid—just make sure it’s not expired. Remember those long-lasting uric acid crystals we were just complaining about? They’re tough to get rid of, but there is one type of cleaner which can do the job. An enzyme cleaner won’t just scrub out the stain like a surfactant. Enzyme cleaners contain living organisms which will consume uric acid crystals and any urine residue that’s left behind. The two cat lady favorite enzyme cleaners are Anti Icky Poo and Nature’s Miracle. Both of these enzyme cleaners are well-known for eliminating stubborn urine odors. Enzyme cleaners aren’t foolproof, though. Because the efficacy of an enzyme cleaner is based on living organisms, these cleaners have an expiration date. If the cleaner has been sitting on the shelf for too long, it will be useless. Ion-based odor removers are super-effective but expensive. Ion-based odor removal technology is a relative newcomer to the home odor remover lineup. It’s also quite impressive. We’ve had good success getting rid of cat urine odor with a positive ion odor remover called Live Pee Free. The interaction of positive and negative ions is what makes the odor-remover work. According to Live Pee Free, the solution reacts with odor-causing molecules making them odor-free. Instead of consuming the uric acid crystals, an ion-based odor remover will simply eliminate their odor. Unfortunately, ion-based odor removals are a lot more expensive than the other ones. A gallon container costs $84.95. Homemade cat urine removers are cheap but don’t always last. We love homemade stuff—homemade cat food, toys, home remedies—but we’re not huge fans of homemade cat urine removers. Most homemade cat urine removers run up against the same issues that we discussed when talking about surfactants. While baking soda, vinegar, and hydrogen peroxide are all great stain removers and can temporarily eliminate odors, they leave the uric acid crystals lurking in the fabric of your couch or underneath your carpet. Unless you’re willing to ferment your own enzyme cleaner for a couple of weeks or months, the nasty cat urine odor will probably come back unless you treat it with something stronger. 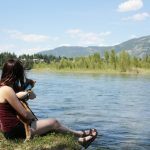 Don’t wait for weeks or months after your cat’s inappropriate urination to clean it up, but if you want to plan ahead, here’s a recipe for a homemade enzyme cleaner. We haven’t tried it, so let us know how it works if you do! You found out why your cat was peeing on the furniture and eliminated the odors that had him coming back—what’s next? Remember, so-called behavioral problems are often caused by stress. That means the best way to prevent any future accidents is to implement a routine for your cat and to provide him with a strong sense of stability. Cats, in general, are sensitive creatures who love routine and a feeling of security. We know change is inevitable, but you can make it easier on your cat by keeping key parts of your day consistent. Feed your cat at the same times every day. 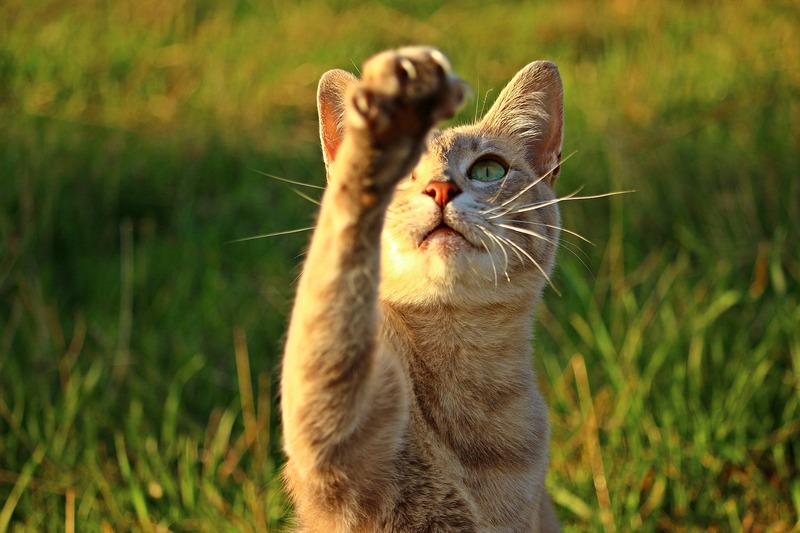 Regularly engage in interactive play with your cat! He’ll be able to release his energy in a non-destructive way and de-stress. Set aside a certain time each day for snuggles. Give your cat his own special space where the dog/baby/other cats won’t bother him. Add vertical territory to your home. Check out our article, How to Make Your Apartment Cat-Friendly, for ideas on how to catify your house. The more you can make routine, the better. Many cats love repetition—it makes them feel safe! Here’s an easy checklist and reference guide to stop your cat from peeing on the furniture. ❑ Find out why your cat is peeing on the furniture. ❑ Is it health-related? Eliminate illness first. 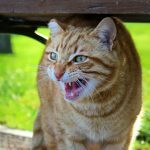 ❑ Is your cat stressed out? ❑ Make sure you’re keeping your cat’s litter box super-clean and using a litter he likes. ❑ Check your cat’s litter box location, too. Is it in a place your cat feels safe in? 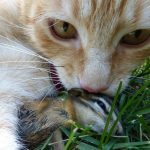 ❑ Is your cat actually spraying—is this a hormone issue? ❑ Once you’ve determined why your cat is going outside of the box, try to get rid of that factor. ❑ Get a black light so that you can find all traces of your cat’s urine stains. ❑ Choose a urine remover. ❑ Surfactants are good for removing stains. ❑ Enzyme cleaners eat up the odor-causing uric acid. ❑ Ion-based cleaners are expensive but eliminate odor. ❑ Homemade cleaners work well temporarily. ❑ Implement a schedule to give your cat a feeling of stability and security. ❑ Enjoy your pee-free furniture and home! What has worked for you? Let us know. If this article helped you out or if you have any suggestions or methods that worked for you, let us know in the comment section. We love your ideas and would be happy to discuss them with you. 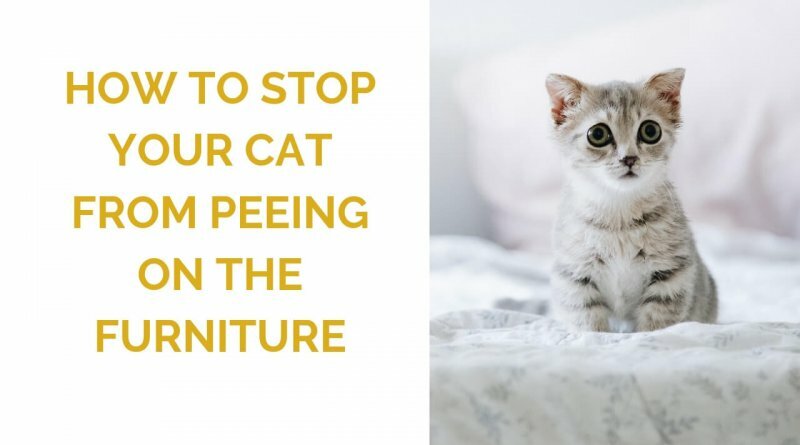 If you have any more questions about how to stop your cat from peeing on the furniture, send us an email. Is it Bad to Let Your Cat Outside?